Explores the mind-set that has produced so many broken homes in the Christian community. It is not a make-you-feel-good sort of book, but a straightforward, no-holds-barred, tell-the-truth-so-your-marriage-will-work book that if assimilated could result in revolutionized relationships. 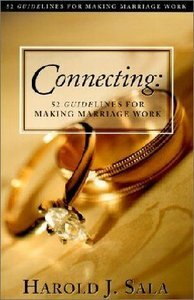 About "Connecting: 52 Guidelines For Making Marriage Work"